Keak Da Sneak and The Jacka perform Windows in Santa Cruz at the Catalyst. This was a surreal moment for me as, as person, and an executive. I had just emerged from a 16 consecutive year prison sentence, and this was the first time I had an opportunity to watch THA JACKA perform in person. Filmed by Stone Ramsey COO of All Bay Music Magazine. MIP Jacka. 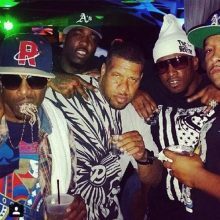 #OaklandNative Sean “Stone” Ramsey | Owner of Ramsey Media Group and COO of All Bay Music Magazine | Manager of The Luniz, 3XKrazy, Lil Bug, Deli, and the Executive Producer of the Bay Area Classic Complilation “International Blunt Funk”.